Except for its roof, David Bellamy’s single-storey cottage in the False Bay suburb of Muizenberg is hidden behind a wall of brick and plant. The bright turquoise roof looks like a neat brush stroke against mountain and blanket of blue sky. The garden, hints of which peek over and through gaps in the wall, is strongly fragrant on a piercingly hot Cape Town spring day. David’s dense thicket garden, with remnants of its long-past incarnation as an English cottage garden, supports an abundance of mostly indigenous plants, and the leaf litter on the ground feeds insects and supports bird life. It’s paradise. 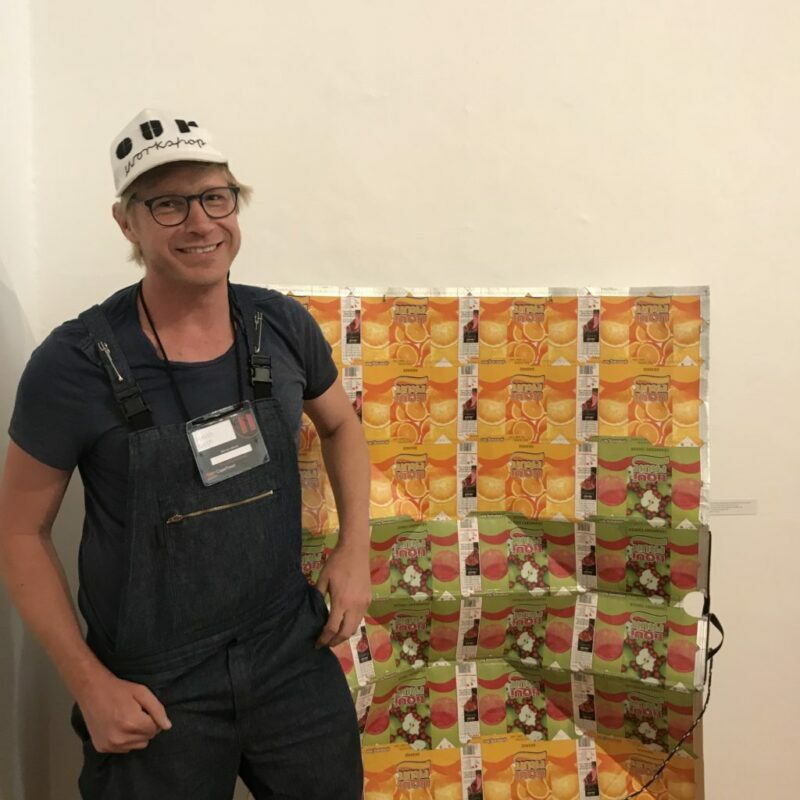 The garden is the theme of David’s new textile design, “Thicket garden – seed bomb” and features in his exhibition, Artist’s Textiles at the Irma Stern Museum. Seed bombs are balls of seeds, which are thrown into fields to introduce vegetation. 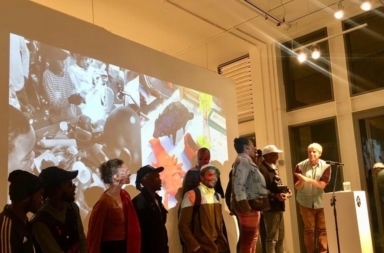 Artist’s Textiles serves too as the launch pad for David’s new project Museum of Making and Tomorrow, a platform about environmental problems and their resolutions, sidestepping arguing and polemics. Along with 11 artists, as curator and artist David addresses environmental and climate change issues using textile as a medium. The works express different ways of dealing with environmental issues. Karen Suskin’s installation, Ideas Read in Cloth, for instance, looks at sustainable materials such as linen and hemp. Heath Nash and Luvuyo Mpuza of Our Workshop use upcycled post-consumer Tetra Pak containers. David studied biology at the University of Witwatersrand, before leaving the country to join the anti-apartheid resistance movement and to study fine art at St Martin’s School in London. 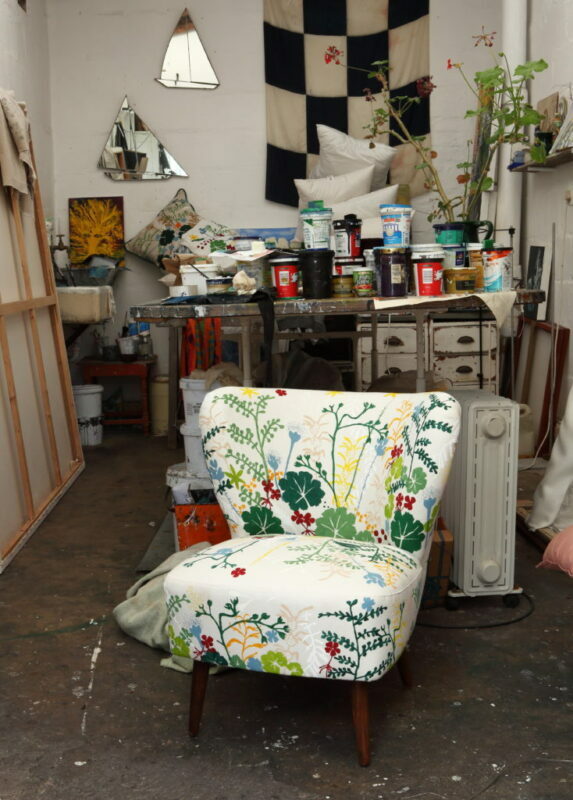 He identifies as both an environmentalist and an artist, and is the founder of Bellamy Bellamy, a textile shop on Muizenberg main road were you find his designs, vintage South African textiles and imported fabrics, including luxurious cotton velvets and Belgium linens. It’s a treasure chest for lovers of design and textile. The house where David has lived since the early 2000s is a tidy mess. The kitchen is cluttered with collected porcelain and ceramic crockery, jars of preserved food and white and grey striped pebbles. 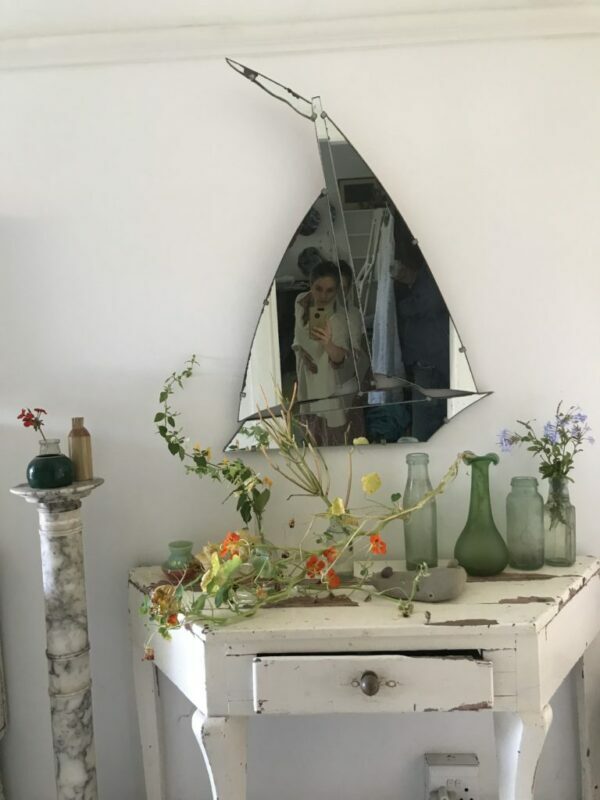 On surfaces throughout the house, there are curated still-lifes of vases and plants and flowers. There are shells and statues of dogs, and artworks everywhere. His studio is a converted garage. 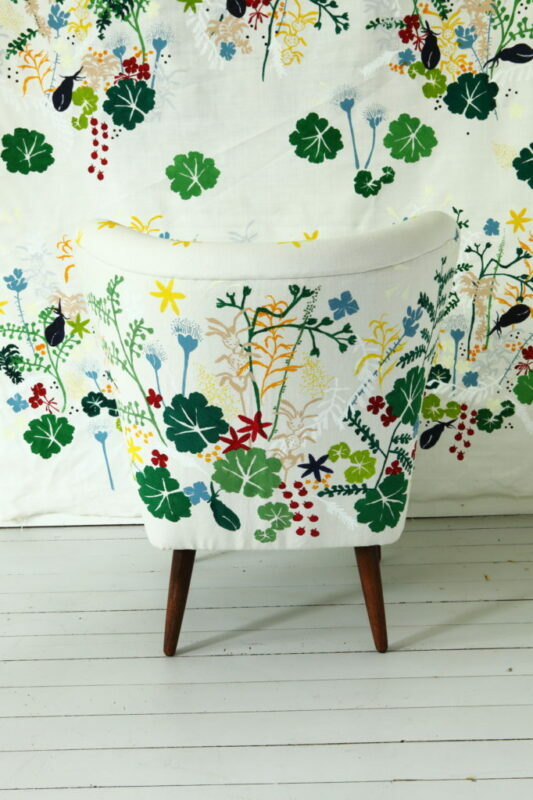 David flips through a book with images of 1930s fabrics that designer Josef Frank, an Austrian who fled Nazism, created for Swedish design house, Svenkst Tenn. There are designs of intricate and vibrantly-coloured flowers, oversized plants, trees, birds and insects. Like David’s current work, the images are fecund and happy. On the studio table are squares of heavy linen on which David’s “Thicket garden – seed bomb” design has been hand-stencilled using low-toxicity and water soluable ink. The linen squares become bags which are on sale at the Irma Stern Museum. An armchair (below) upholstered in the same design will form part of David’s collection of works on the exhibition. David says his new textile design argues for “endemism and for sharing the natural world with our planetary next-door-neighbour-Earthlings in perpetuity”. “Art is about joie de vivre,” says David. “And so is the natural world.” As an environmentalist, David is aware of climate catastrophe. 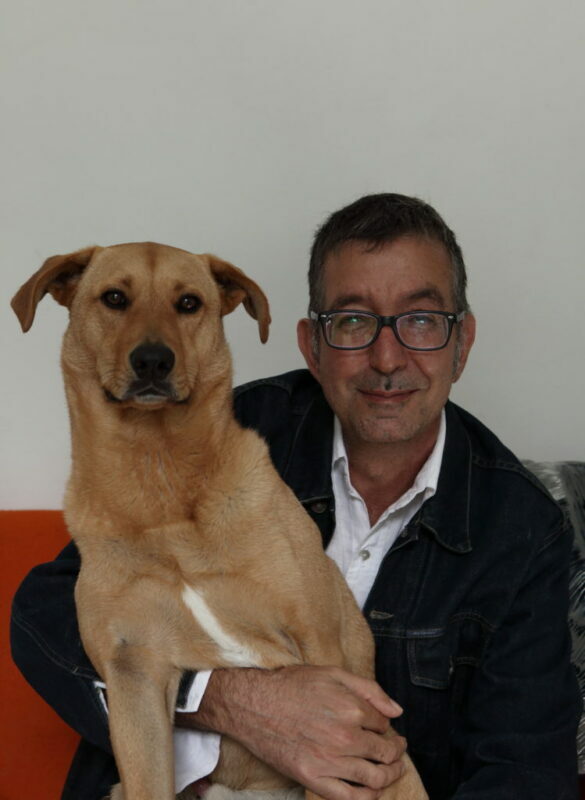 “Bad environmental things happen all the time so the secret of life is to put our weight behind the good things and make sure they happen faster than the bad things.” David (with his dog, Tommy below) is committed to not being gloomy, which is clear in his art and in his lifestyle. What can you expect at the exhibition at the Irma Stern museum? David’s brief to the artists was to create “a two dimensional artwork on the wall, its interpretation or rendering into a textile (also two dimensional) then the textile’s movement into three dimensions as furniture, lampshades or clothes”. The concept of textile is used very broadly. Zayaan Khan, a seed librarian, has steeped wool in a solution made from wild plants. She has used this wool and kelp to weave objects. Sanell Agenbach has made a ceramic textile. Greg Stock’s drawing machine produces patterns on cloth responding to data sent from scientists at drinking water dams, enabling us to visualise our relationship with water availability. 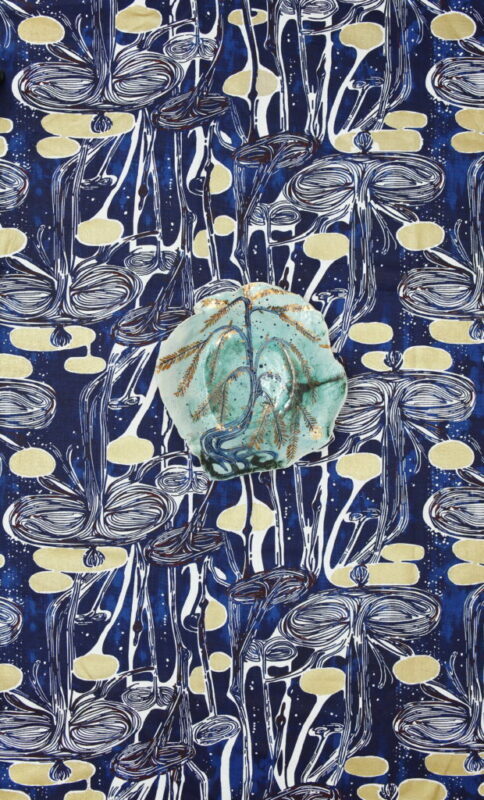 Ruan Hoffmann (image below) presents a ceramic painting and a blue and gold colourway waterlilies fabric. David says, “The content can be decoded if you bother to look for it. You might find issues of fracking of biodiversity loss.